La Reunión estará organizada en forma de sesiones plenarias, sesiones paralelas y reuniones de grupo. Por primera vez dedicaremos una sesión plenaria a la divulgación y enseñanza de la Astronomía. La SEA 2018 ha invitado a la Sociedad Portuguesa de Astronomía y a la comunidad astronómica lusa a compartir nuestra Reunión. Es intención de la SEA dar a conocer las colaboraciones científicas ya existentes entre grupos de ambos países y potenciar el inicio de otras nuevas. En los enlaces a la derecha se puede encontrar información detallada sobre la Reunión. 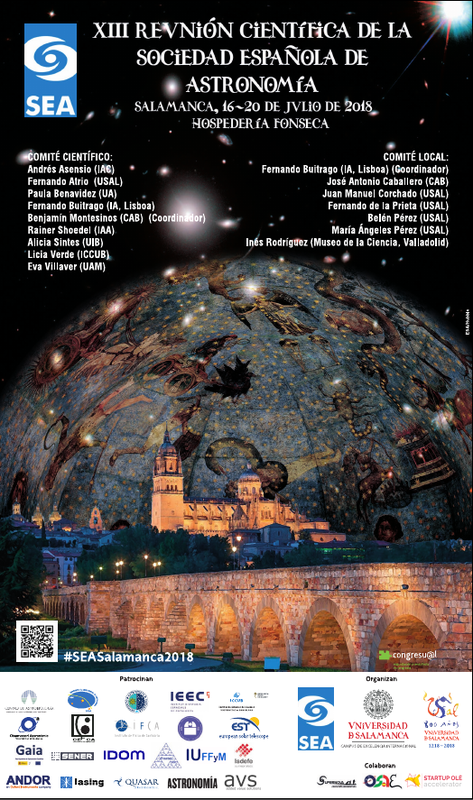 The Spanish Astronomical Society (SEA) holds its XIII Meeting in the city of Salamanca from 16th to 20th July 2018. The conference will be held in the famous Hospedería del Colegio Arzobispo Fonseca and the adjacent Colegio Fonseca, contributing to the celebration of the 800th anniversary of the University of Salamanca. The Meeting is organized around plenary and parallel sessions. For the first time there will be a plenary session devoted to teaching and outreach of Astronomy. SEA has invited the Portuguese Astronomical Society and the Portuguese astronomical community to share and enjoy our Meeting. It is our intention to describe in detail the on-going collaborations and start new ones between both communities. Detailed information on the Meeting can be found in the links on the right. As previously announced, the Proceedings of the XIII Scientific Meeting will be published electronically through the SEA web site as "Highlights of Spanish Astrophysics X". All papers will have an ADS reference. The style files and instructions will come soon. All the contributed papers must be written in English (please download the template and detailed instructions). The recommended length of the contributions is from 4 to 6 pages for "normal" contributions, and from 8 to 12 pages for invited contributions. Posters will use the style files provided to prepare a one-page document with title, author list, affiliations, and abstract. Additionally, the pdf of the poster as presented at the meeting can be uploaded too (please, keep reading). Fecha límite de recepción de solicitud de comunicaciones. Aquí os vamos dejando las fotos de la Reunión.